The NBA Finals begin tonight with Game 1 taking place at Oracle Arena and according to Las Vegas, the Cleveland Cavaliers stand no chance against Golden State. The Warriors are -1000 for the series and the comeback for Cleveland is +650, but the thing is the Warriors are not playing their best basketball at the moment. The Warriors are dealing with injuries (Andre Iguodala won’t play in Game 1) while the Cavaliers keep winning and overcoming all the obstacles in the way to prove people wrong. With LeBron James on the court, it’s unlikely this series will be a cakewalk for the Warriors, even though that is exactly what a lot of people expect. Keep in mind that James has only been on the favorite team in two of his nine NBA Finals and he’s already won the title twice as an underdog (2012 and 2016). The bad news is that this year’s series moneyline is a finals worst for Lebron (+650) even worse than in 2007 when the Cavaliers were a +350 underdog against the San Antonio Spurs. Problem is LeBron is not that great a bet in the finals as his teams only cover 44 percent of the time in that instance. As an underdog, he’s 8-14-2 in the finals and he’s 0-4 straight up and 1-3 against the spread when his teams are double-digit underdogs. As for Game 1, the spread is 12.5 and the total is 214. Although the Warriors are expected to beat the Cavaliers they may not be able to cover on such a big spread. Looking back at the last time there was a point spread of this magnitude in the NBA Finals was in Game 1 of the 2001 finals and in that game the Lakers were beaten by the underdog Philadelphia 76ers in overtime. As for the series price, it’s always risky to take such a big favorite, especially when looking back at how injury prone the Warriors have been this season. It only takes an injury to Steph Curry for this series’ tide to turn around and give the Cavs a real chance to win it all. That would usually not be a concern, but Curry has suffered recurring ankle issues throughout his career and this year he’s already dealt with a hamstring injury so it’s not far-fetched to envision that happening. 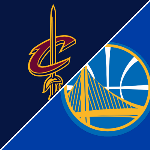 As for the total at 214 is important to note that the total has gone under in seven of Cleveland’s last 10 games when playing on the road against Golden State. However, last year these two teams averaged 236 points per game, so the total may be a little too low.